Now that I’m eating dairy-free I am so grateful for the pints of this yummy jam in my freezer. 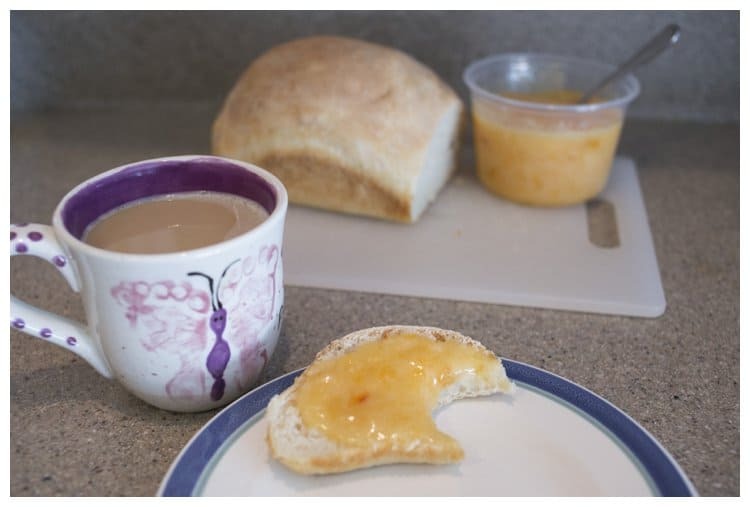 This jam paired with a slice of homemade dairy-free bread and a cup of coffee with creamy almond milk is my favorite dairy-free breakfast. Actually, this is my only breakfast at the moment. Breakfast is the meal I am struggling with most since giving up dairy. I used to eat greek yogurt and granola most every morning. I do not like to start school days by cooking breakfast. I like for breakfast to be grab & go, quick & easy. Miriam and I made excellent french toast with almond milk and almost stale bread this morning. That will be a great choice for Saturday morning, but it’s too much mess and clean up and brain power needed early on a school morning! On school mornings I need a minute to myself first thing. Breakfast for the kids needs to be as independent as possible and mine needs to be quick so I can steal a few minutes of alone quiet before the chaos of school begins. Plus, the longer we spend in the kitchen in the morning, the less likely school will be finished by lunch time, as we prefer. I often make muffins in the afternoon, which we eat for the following morning’s breakfast. But, I haven’t picked up any diary free chocolate chips yet and in my opinion any muffin without chocolate isn’t worth eating. Eggs should also be a good option, but as much as I like eggs I don’t like them first thing in the morning- they are more of a brunch or lunch option for me. Do you have any recommendations of yummy, somewhat healthy and easy dairy-free breakfast ideas for me? 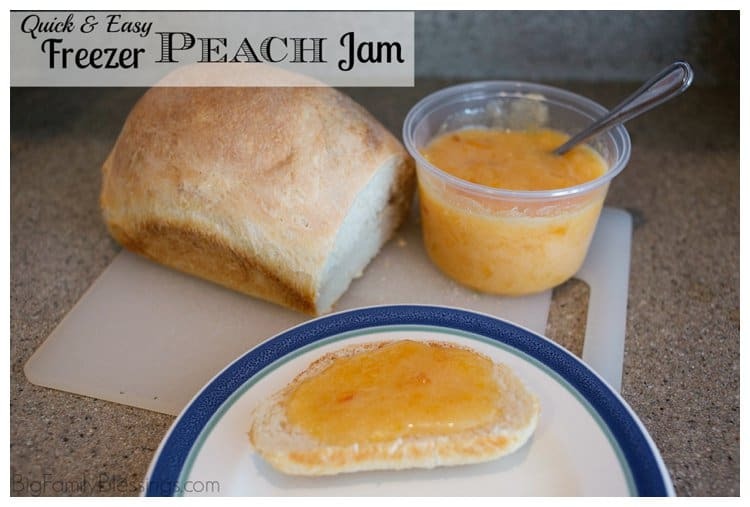 While you are sharing your ideas with me, I’ll share my peach jam recipe with you. Prepare the peaches by peeling, chopping and crushing them with a potato masher. 4 cups prepared takes approximately 2 pounds of peaches. In a large pot, mix the lemon juice into the 4 cups of prepared peaches. Slowly stir in the pectin. Allow the pectin and fruit to sit for 30 minutes, stirring the mixture every 10 minutes during this time. Add the corn syrup and sugar, stirring and heating over low heat just until the sugar is completely dissolved. Do not let the mixture heat to boiling, it really should only get warm to the touch. 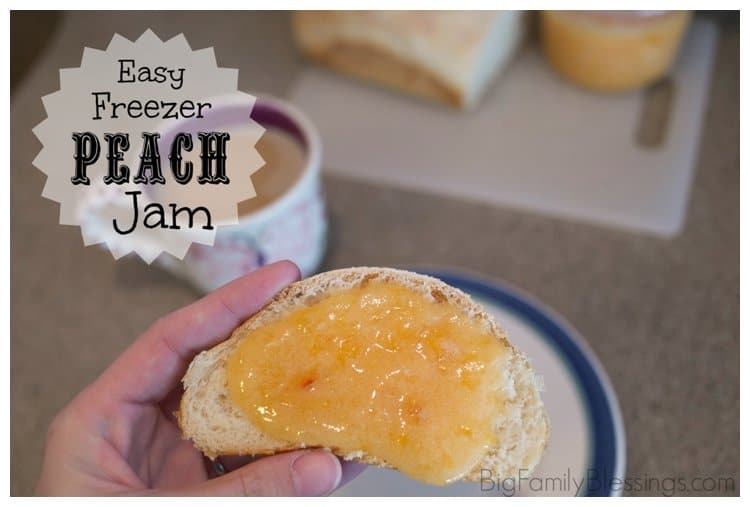 Fill plastic containers with jam, cover and let stand overnight. Store in refrigerator for up to 3 weeks, or freezer for up to a year. I have a favorite blueberry muffin recipe that I do dairy-free with coconut milk. http://allrecipes.com/recipe/to-die-for-blueberry-muffins/detail.aspx?event8=1&prop24=SR_Title&e11=blueberry%20muffins&e8=Quick%20Search&event10=1&e7=Home%20Page I leave off the strudel, and the muffins are even better the next day (more moist)--I often have to add extra coconut milk to the batter to make it wet enough. Also what about peanut butter on toast or almond butter? Smoothies made with coconut milk are good (or almond milk, but for some reason, coconut milk is my go-to milk sub). www.ohsheglows.com has some great recipes, and you can search by breakfast foods.